The Ursa Minor (Latin: "Smaller Bear") is a basic distortion circuit similar to the old Electra. I have tweaked it in a couple of ways to produce something that I think more musically interesting and gig-worthy. 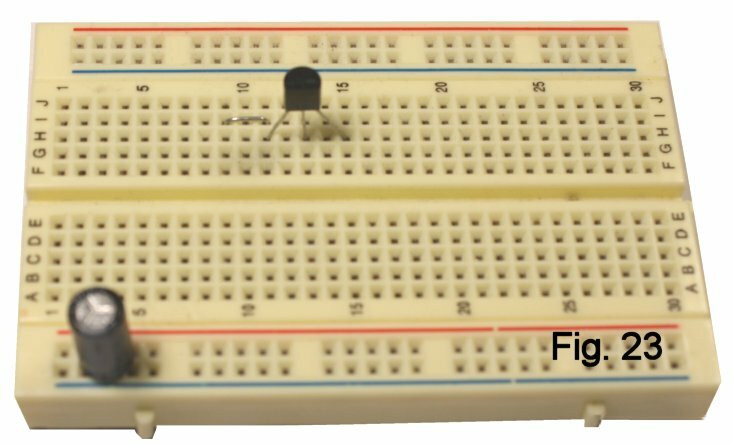 In this article, I will walk you through setting up the circuit on the breadboard and trying out a mod or two. When you are done, you will have a better understanding of the relationship between a schematic and the physical components and connections that it represents. 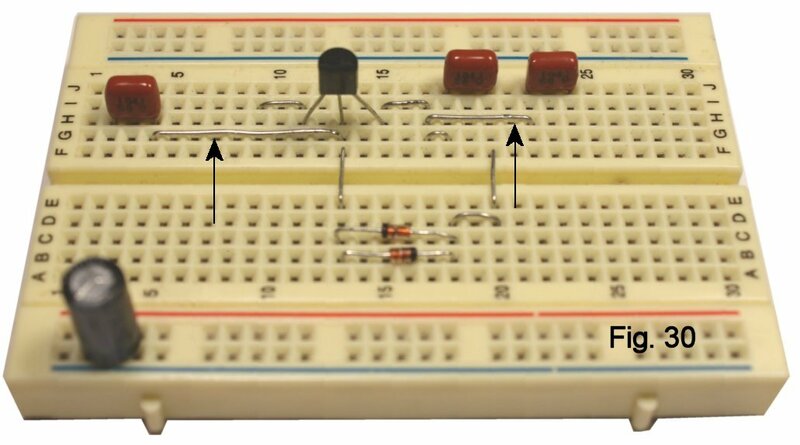 Also, you'll have a working circuit that can be committed to a soldered build on perfboard or a PC board. 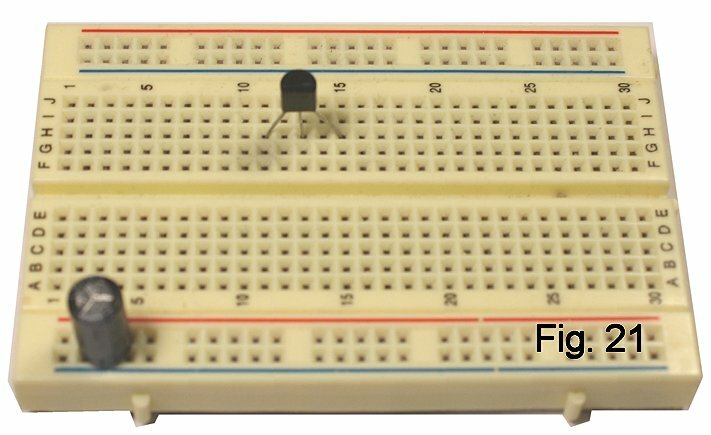 A full kit for the breadboard version is available. So let's go! Trim the leads of a 100 mf. ("microfarad") electrolytic capacitor, following the convention of leaving 1/4" to 5/16" of lead length for insertion in the board. Electrolytic caps are most often polarized; on radial-case types like this one, a black band marks the negative side (Fig. 18.) Install the capacitor directly across the power rails in the third vertical set of contacts (Fig. 19.) While the part could go anywhere on the power rails, I am being very prescriptive so that your layout will be identical to mine and so easier to debug if necessary. Follow my footsteps (bear tracks?) and layout this time around; once you have the idea, you're free to do whatever works. Now to install transistor Q1. If you bought the kit, it included three devices, two silicon and one germanium. All have three leads: Collector, Base and Emitter, identified as C, B and E in the schem and in Fig. 20. Start with the silicon 2N5089; this is the one in the half-circular plastic package called a TO-92. Orient it with the Collector in the third horizontal row, column 15, and spread the leads to span five holes (Fig. 21). 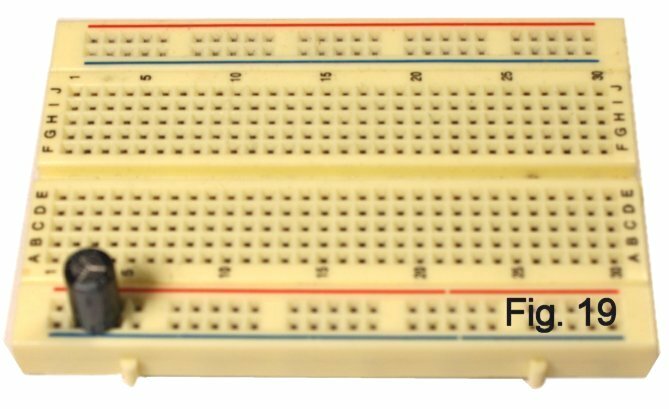 Using chain-nose pliers, bend a short length of bare wire to span three holes in the breadboard (Fig. 22). 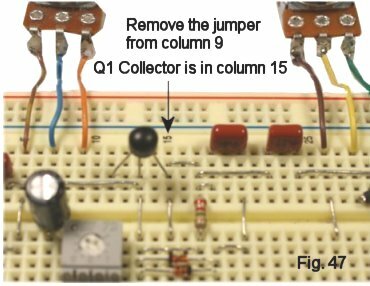 Install this jumper in the second row, same column as the Emitter of the transistor (Fig. 23). Now form two more jumpers, one to span three holes one to span four, and install as shown (Fig. 24). Note that I am purposely spreading out the connections so that the layout will be clear. Similarly, I am working from left to right on the board, but that's not engraved in stone, either. In future builds, you can choose any layout that you want, and it can be as compact and/or chaotic as you find practical. I tell you from experience, though, working systematically and relatively neatly makes documentation and debugging Much easier. Find a polyester film capacitor (labeled 104J, Fig. 25). These are not polarized, and the spacing of the leads is exactly three holes on the breadboard. Also find two silicon diodes. The glass cases have a black band that marks the negative side (Fig. 26). Cut the leads of the capacitor down to 5/16" long. Using chain-nose pliers, bend the leads of the diodes on each side of the body to span two holes, then cut down to 5/16" long using side-cutters (Fig. 27) . Insert the capacitor between column 18 and column 20 in the first row. The diodes go "back-to-back" (black bands opposite each other) in the second and third rows between columns 13 and 18 (Fig. 28). Three jumpers are needed (2 holes, 4 holes, 3 holes), and I have pointed to them. You have made your first connections! Fig. 29 shows the points in the schematic that you wired. Got the idea? My choices for these component locations were arbitrary, but they turned out to be perfectly workable as I added more parts and connections. When you get to "rolling your own," if your first choice of a location doesn't pan out, back up and try somewhere else! Using two jumpers, add C2 and C5, .1 mf. capacitors as shown in Fig.30. Fig. 31 shows them added to the circuit. Resistor R2 is 4.7 Meg (Yellow, Violet, Green, Gold). Bend its leads right at the body and it will span four holes. 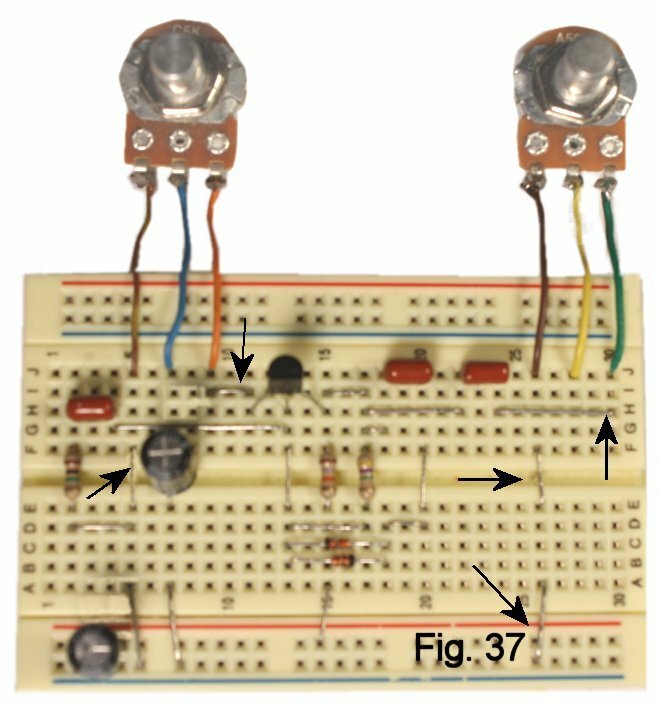 One jumper makes the connection to the Base of the transistor. All of this is shown in Fig. 32 and Fig. 33. Last components before we add the pots: Resistor R1 is 1 Meg (Brown, Black, Green, Gold). Bend its leads close to the body to span four holes and install beneath capacitor C2. Two jumpers give it a connection to ground. Capacitor C4 is a 47 mf. electrolytic. Form the leads to span four holes and install in column 7, paying attention to the polarity marking. Add the jumper to ground on the negative side. Resistor R3 connects between the Collector of Q1 and the positive power rail. It's labeled "selected", and you'll find right value bagged with the transistor if you bought the kit. If you are rolling-your-own, it's nominally 18K (Brown, Gray, Orange, Gold) for a typical 2N5089 transistor. I will talk later about how to trim the value and why that's desirable. Again, form leads to span four holes and install to the left of R2. Add the jumper to the positive supply rail. We are getting close (Fig. 34 and Fig.35). The wiper of the level pot will connect to the output jack. See Fig. 37 and Fig. 38 for what things should look like now. 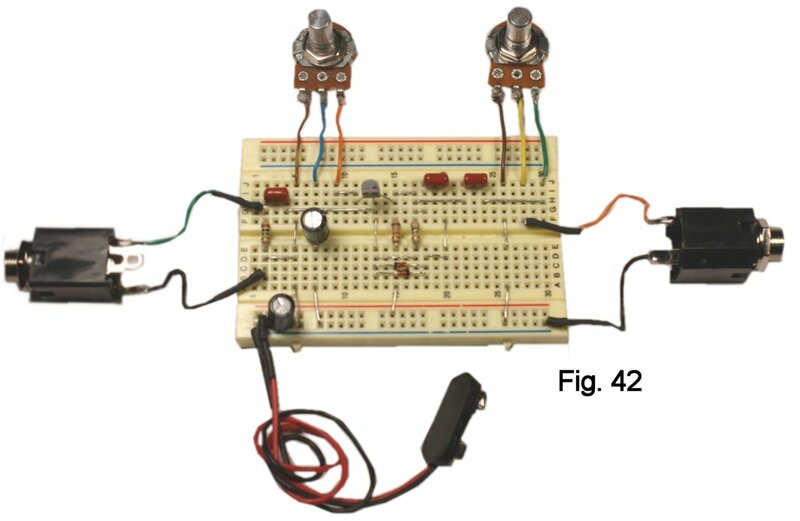 For testing purposes, we want to install input and output jacks as shown in Figure 39. 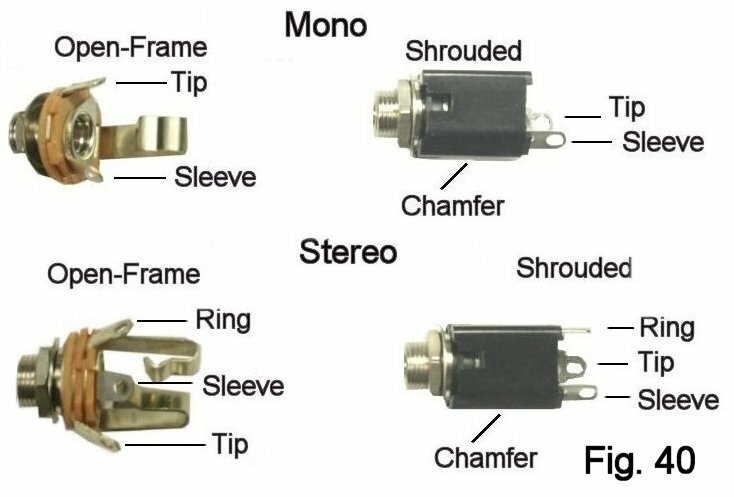 If you bought my kit, it includes a mono and stereo jack, both shrouded. However, some builders may have the open-frame style shown on the right. 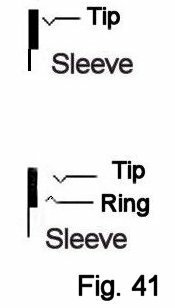 Compare what you have to the pics and be sure that you can correctly ID tip, ring and sleeve. The open-frame stereo jack shown is a Switchcraft #12B; note that the arrangement of the contacts may be different on other makes. In a typical pedal build, we would use a stereo jack for the input and connect the ring contact to switch battery power. To keep things simple here, we use only the tip and sleeve. Connect a short length of insulated wire to tip and sleeve of each jack. Add bare wire terminations to the ends that go to the breadboard just as you did for the battery snap. Yes, shielded cable would reduce noise here. However, it's harder to work with and not necessary for test purposes. The sleeve leads are plugged to the ground bus. Input tip goes to the junction of R1 and C2, output tip to the wiper of R5. Things should look like Figure 42. ARE YOU READY?? Connect your amp and connect a battery. Turn up the level control and turn up the fuzz pot till you hear distortion. Try playing with it a bit. "Taper" in potentiometers is the relationship between percent rotation and percent change in resistance. If you didn't buy the kit and are using a linear taper pot for R4, you'll probably notice that the control of distortion is tight at the clockwise end. The reverse audio taper pot in the kit corrects this problem. 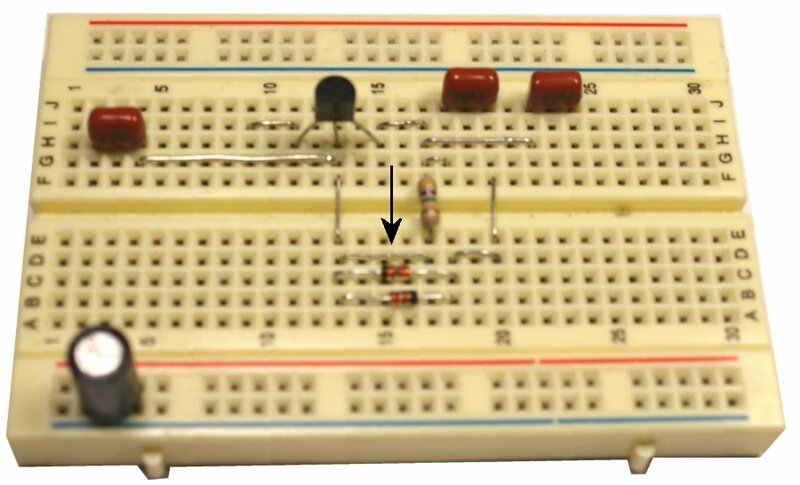 Remove C3 so that the diode loop is disconnected. You'll notice that the volume goes up A Lot, and there is no distortion (unless the level pot is so high that you are overdriving your amp!) Yes, it's possible to add a switch to make/break the loop when you do a soldered build. Other clones of the Electra that I have seen do not suggest changing the DC bias. If you substitute a 25K or 50K trimpot for R3, you can adjust the operating point so that the transistor is more "on" or more "off". Figure 43 shows top and bottom views of one of my SKU 1015 cermet types along with its schematic symbol. 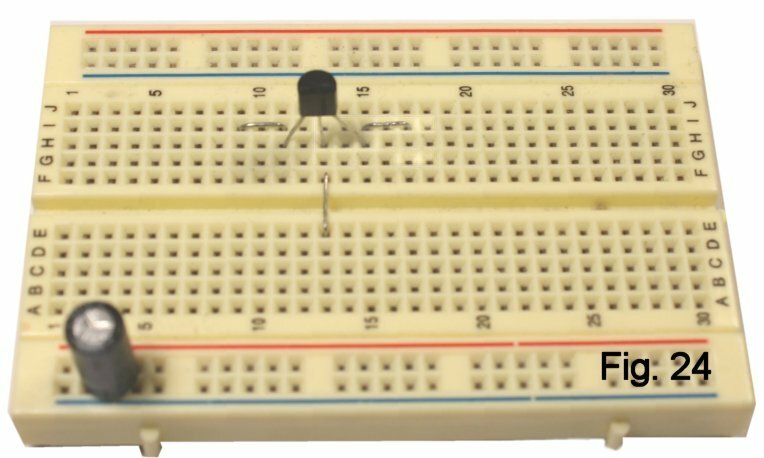 When installing it on the breadboard, install a jumper in place of R3 and add two jumpers to connect the trimpot (Fig. 44). Start with the adjusting screw at about the halfway point before applying power. Try playing some licks with the bias at various settings. I like the result with the voltage at the Collector of Q1 around half the supply voltage (Figure 45). Some versions of the Electra used a 2N3904, which can have a gain of less than 100--not enough to ensure that the diodes will clip strongly. For silicon, I suggest a 2N5088 or 2N5089. A Darlington transistor like the MPSA13 will also work fine. I did not hear any difference in tone between these devices when biased similarly. On the other hand, to my ears, a high-gain germanium device gives a softer edge. It plugs in the same way as the 2N5089; just pay attention to the pinout, referring to figure 20 if you need to. I lowered R2 to 2.2 Meg in order to get the range of bias control where I wanted it, YMMV (Fig. 46). An interesting result to my ears came from a Darlington pair--two cascaded transistors--made from a low-gain NPN silicon "dot" feeding the germanium device. The jumpering needs to change a bit to accommodate the two devices; refer to the detail pics figure 47 and figure 48, and pay attention to the pinouts and the schematic (Fig. 49). Each diode in the loop clips one half-cycle of the signal, so a loop using two diodes of the same type will clip both halves equally. Germanium has a lower threshhold voltage for conduction (Vfwd) compared to silicon, so inserting a germanium diode will result in one half-cycle being clipped more than the other (Fig. 50, 51). The difference in clipping is noticeable, and hard to describe...to my ears maybe a little less "squished" than all-silicon. Numerous combinations of diodes (and LEDs) will work, and the differences in Vfwd and internal capacitance will give different timbres. Reducing the value of the input capacitor to .01 mf. gave me an "in the pocket" tone that some players would probably like in particular lead passages. Reducing the value of the output cap cuts out some low end, which you might like, but it also reduces volume. 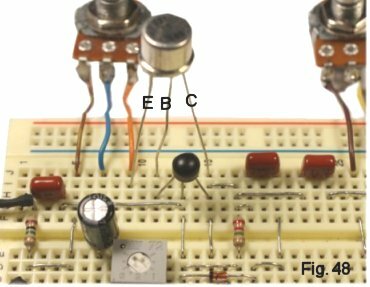 In the article that follows this one, I will show how to wire the circuit on perfboard and create a finished pedal in the Bare Box #1. 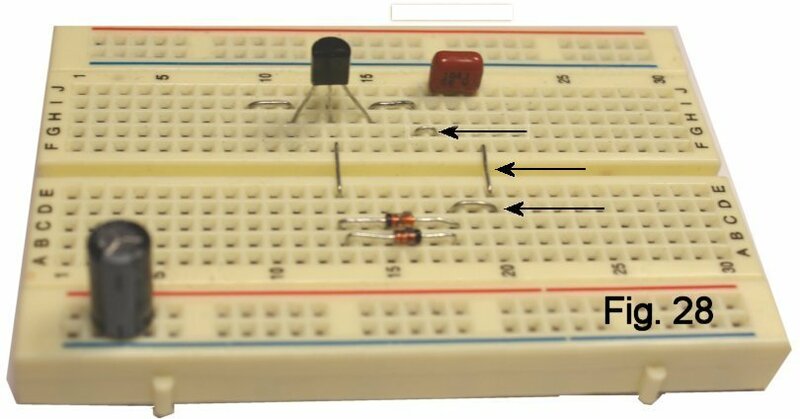 I hope you enjoyed learning to use the breadboard, and that you will use your new skills to hack into other designs and try out your own ideas. 1 Selected For R3 - See Text 0900, 0901, etc.